This is InformationWeek's Tech Digest on choosing the right consultant for your organization. Access is free with registration in the InformationWeek community. Just register at right. There's no cost, and it takes only a few minutes. Once done, click the "Access Content Now" button at right. Networking Is Hard. 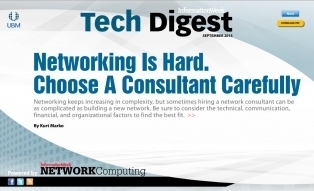 Choose A Consultant Carefully: Networking keeps increasing in complexity, but sometimes hiring a network consultant can be as complicated as building a new network. Evaluate A Consultants Technical And Interpersonal Skills: Be sure to consider the technical, communication, financial, and organizational factors to find the best fit.